We’re the UK’s number 1 education projector store with over 50,000 projectors sold since 2001. We’ve got the UK’s largest range and biggest stock of classroom projectors from the world’s best brands. Classroom settings can vary significantly depending on space, light, frequency of use and class sizes. 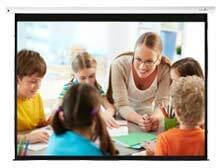 Our range of education projectors offers something for any educational environment. Many of our projectors also support the latest in classroom technology, making it easy for teachers to encourage engagement and collaboration. over 80cm back from the screen. under 80cm back from the screen. Full line up of standard, short and ultra short throw projectors.